The use of cinnamon can be traced way back remote times – Moses is said to have used cinnamon when he made the holy oil, and ancient nations gave cinnamon as a gift for monarchs and gods. Cinnamon has been regarded as a very valuable spice, its value sometimes being likened to gold. Nations who were involved in trading centuries ago regard cinnamon as highly-priced and highly-coveted item. Over the years, people have discovered the source of cinnamon and, with the advent of technology, acquiring cinnamon is no longer very difficult. Cinnamon has been used as a condiment for cooking, giving the dish a sweet flavour coupled with an aroma like no other. 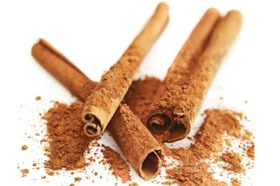 Liqueurs, tea, cocoa, chocolates, breads and fruits have benefitted from the use of cinnamon. Medical experts have been studying the health benefits that one can get from the consumption of cinnamon. One case to prove that point is a recent randomized, placebo-controlled, double-blind study conducted by researchers from London’s Imperial College regarding the benefits of cinnamon on diabetes patients. Cinnamon and Diabetes: Is there a link? In order to find the association between cinnamon and its effects on patients with diabetes, a group of researchers from the Imperial College in London, headed by Dr. Rajadurai Akilen, conducted a study which involved 58 patients diagnosed with type 2 diabetes and whose mean age was 55. Each participant was randomly assigned to either of two groups: one group received a supplement of 2 grams of cinnamon every day, and another group received placebo. The length of time wherein the participants received the intervention was 12 weeks. After the study, the results revealed that the intake of cinnamon supplement was linked to an average decrease in systolic blood pressure of 3.4 mmHg, and a decrease in diastolic blood pressure of 5.0 mmHg. As for the results of the placebo group, no significant reduction in blood pressure was noted. When it comes to the participants’ blood sugar level, the researchers noticed a decrease in glycated haemoglobin levels over twelve weeks in the cinnamon group – from 8.22 percent to 7.86 percent. In the placebo group, on the other hand, researchers noted an increase in glycated haemoglobin levels – from 8.55 percent to 8.68 percent over a period of twelve weeks. Glycated haemoglobin is used in measuring the levels of sugar in the blood. Dr. Akilen and his co-workers said that the clinical trial is a first in the UK which has confirmed significant valuable effects of 2 grams cinnamon on the blood pressure and glycated haemoglobin of patients diagnosed with type 2 diabetes coming from different ethnicities. The authors, writing in Diabetic Medicine, said that the 2 gram dose of cinnamon that was administered to the participants of the study was well tolerated and considered safe for the entire duration of the study. They concluded by saying that the durability and sustainability of cinnamon’s effects has not yet been tested, and its long-term safety and tolerability has not yet been determined. Nevertheless, the short-term effects of cinnamon use for type 2 diabetes patients appear to hold a lot of promise. It helps lower bad cholesterol (LDL) levels. Studies have shown that it has the ability to stop yeast infections that have become resistant to medications. A study conducted by researchers from the U.S. Department of Agriculture located in Maryland revealed that cinnamon reduced the propagation of lymphoma and leukaemia cancer cells. Cinnamon is said to prevent the formation of blood clots. A study conducted at the Copenhagen University revealed that patients who were given half teaspoon of cinnamon powder mixed with one tablespoon of honey each morning prior to eating breakfast experienced a significant relief in pain brought about by arthritis after one week. Another study indicated that inhaling the smell of cinnamon helps boost memory and cognitive function. More and more people are being diagnosed with diabetes each day that the statistics appear to be very alarming. The European Union 25 currently has 19 million diabetics, and the numbers are expected to rise by up to 26 million by the year 2030. Four percent of EU 25’s current total population are diabetics. In the United States, 24 million people – or eight percent of America – are diabetics. According to the 2005-2007 figures of the American Diabetes Association, the total cost being spent on diabetes is a whopping $174 billion, and $116 billion from this is being spent on medication. Diabetes results from high amounts of sugar levels in the blood. If left uncontrolled, diabetes will eventually cause problems in other parts of the body and will seriously interfere with the body parts’ normal functioning. Examples of body parts that are most commonly affected by the complications brought about by uncontrolled diabetes include the eyes (diabetic retinopathy), feet (peripheral vascular disease), nerves (diabetic neuropathy), and the kidneys (diabetic nephropathy). Being diagnosed with diabetes also puts a person at a higher risk for cardiovascular diseases as well as joint and bone disorders. Sexual dysfunction, digestive and skin problems as well as oral and dental problems are long-term complications of uncontrolled diabetes mellitus. Studies have shown that the quality and duration of sleep can affect the body’s ability to properly regulate the production of insulin and that interrupted or short sleep can disturb insulin production. Insulin is produced by the pancreas in order to control the levels of sugar in the blood. In order to ensure a good night’s sleep, do some exercises during the early part of the day. It will also help if you establish a regular time for sleeping and waking up. Also, avoid caffeine especially before going to bed. Regular exercise helps a person lose extra pounds and promotes better health. However, researchers have also discovered that exercising is associated with the way the liver gives out glucose in order for it to be used by the body. It is advised that workouts should be done right before a meal. This is according to researchers from the University of Michigan. Stress causes the release of hormones, such as adrenaline, responsible for the fight or flight response. Once these hormones accumulate, fat and glucose stores are released into the blood stream which, in turn, raises the levels of sugar present in the blood. In order to prevent this from happening, it is important that a person recognizes the stress levels in his life and then try to minimize its impact. Learn to take deep breaths, or do some meditation exercises because having the ability to relax will do wonders to one’s blood sugar levels. Aside from helping in the digestive process and in easing constipation, soluble fiber helps lower cholesterol levels, and improves blood sugar levels as well. Avoid foods processed foods and those that contain refined carbohydrates. Go for foods rich in fiber such as broccoli, whole wheat breads, beans, etc. Scientists in Spain conducted a study which revealed that a diet rich in vegetables, extra virgin olive oil and fish provided remarkable results when it comes to reducing a person’s risk of diabetes. It is recommended that a person consume two or more servings of vegetables per day, eat three servings of fish per week, and have fresh fruits for snacks and dessert. This entry was posted on Wednesday, December 1st, 2010 at 9:55 pm	and is filed under DIABETES, EXERCISE FITNESS, FOODS DRINKS. You can follow any responses to this entry through the RSS 2.0 feed. You can leave a response, or trackback from your own site.